Last year, Hadley was apprehensive about starting Kindergarten, and by apprehensive I mean she spent hours and hours sobbing in the days leading up to the first day of school. My efforts to console and calm her were met with no success. So I decided I'd have to bribe buy her a nice little back to school gift. She seemed to like it, but when the first day of school arrived, she didn't want to wear it. That was fine with me - I wasn't going to push it. I would be thrilled to just have her walk through the doors. I had forgotten about the necklace until recently when Hadley was showing me all of the jewelry in her jewelry box. ME: Hadley, where is your 'Be You' necklace? HADLEY: Oh, it's in a drawer. ME: Why isn't it in your jewelry box? Why don't you ever wear it? HADLEY: Well, mom, it's uh, kind of embarrassing. ME: What!?! Why is it embarrassing? HADLEY: I don't know mom. It just is - its all like 'Be You.' 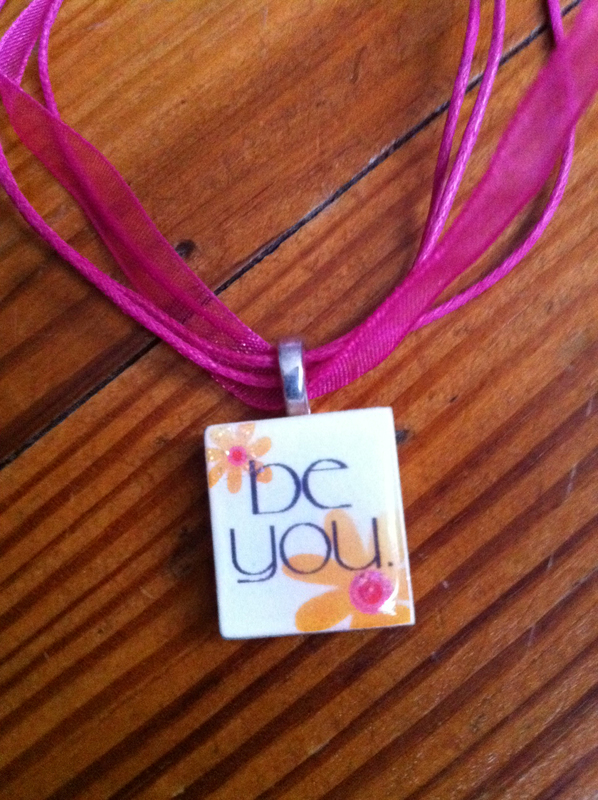 A necklace that says something? It's weird. ME: Oh ok, well you don't have to wear it. It's fine. Secretly, I was crushed! She didn't just not like my gift - she was embarrassed by it. So embarrassed that she wouldn't even include it amongst her other jewelry - it had gotten shoved in the back of the underwear drawer. Sheesh! A few weeks later, Hadley was playing with her American Girl Doll and asked me if I could be the teacher. I said sure. This requires absolutely NO effort on my part. This is one of my favorite games. She spends a significant amount of time readying her doll for school and then "drops her off" with me, the teacher. Hadley then runs off to play while I "teach" the doll. Hadley's note to her doll. Even though her six-year old taste had deemed the necklace all wrong, the message was just right. It had sunk in. She got it. She was sharing the message with her doll as she sent her off to school. Hadley probably figured she'd need some encouragement since she'd be facing such a mean teacher. 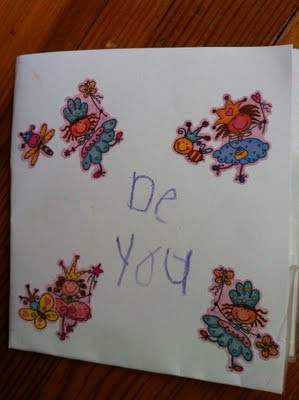 Hadley's little note of encouragement to her doll, in turn, encouraged me. The message being: Keep going. Keep trying. You're getting through. In small amounts and in small doses, she's hearing you. It was a small victory - but I'll take it and hold onto it and if I lose it, I'll know to check the underwear drawer.